They may have a smaller brain but my guess is the .8 of it is geared to manipulating their 2 legged servants. They sleep when they want, play when they want, pretty much eat when they want. We, on the other hand, run around trying to find food they'll eat, comfy beds for them put in the correct spots, and supply lots and lots of toys. Bigger brains don't mean smarter. Along with nearly constant demands for physical and mental attention. Actually I'd put the percentage at closer to .85 or .9 . I won't disagree with that. and the cats I'm feeding are feral. No hugs, a couple I can pet while eating. maybe. And that's not counting having to go to different stores for different flavors & types. Or getting down on your knees to dig way to the back of the shelf for last 3 cans of the current favorite, and hoping it's still the favorite when you get home. something tells me you've had cats. Or maybe I should say you've been owned by a cat or two. Twelve since 1985. My personal best is 7 at one time (not counting dogs). I did the monkey the other day getting it off the top shelf. 36 cans later I realized it was tuna not salmon. Nothing like restocking. Oh yeah, I've done that more times than I can count. I wish the pet food people would stop relying on different colors to id all the different flavors & types they have. There doesn't seem to be enough variety of colors in there labeling dept. to cover all of them. I've lost count of the times I've grabbed the wrong one simply because the color was nearly identical to the one I wanted ( Fancy Feast turkey prime filets and Salmon & Shrimp pate for example). And of course, the mistakes you bring home will not be on the "maybe I'll eat it some day" list, so you're stuck with it. How about the pet food companies do away with the fancy graphics and just make the printing on the label big enough to actually see. Us cat wranglers need all the help we can get sometimes. Bobby the cat went missing from Montana more than a year ago. Last month, he surfaced in Nevada. 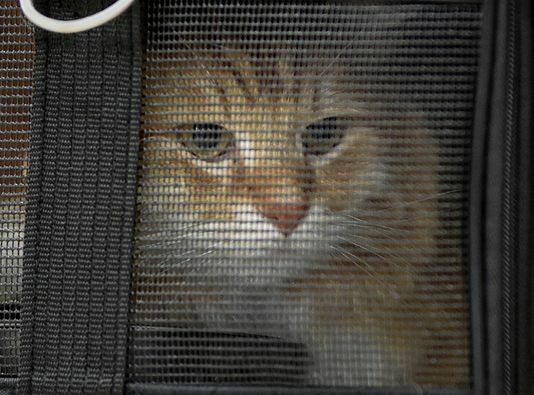 The orange tabby was taken in as a stray at Fallon Animal Control on Sept. 25. They scanned his microchip and found he belonged in Big Sky Country. “We aren’t sure how he got here. We do have some theories,” said Angela Rudolph of the SPCA of Northern Nevada. Bobby’s owner, Kyle Preston of Great Falls, told SPCA there’s a railroad track across from his house. He suspects Bobby might have somehow hopped onto a train and came all the way to Nevada. He's a cat hobo. What are the odds he does it again, now that he's had a taste of the hobo lifestyle? Kitty Kats are great. I was over at a friends house yesterday, and had three on me at one time. Then the dog wanted to climb on me. I am a GD pet magnate!